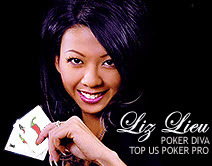 Liz lieu will be playing at the WSOPE in London on Monday the 10th of September. All poker enthusiasts will be able to tune in to follow the poker diva’s experience at the WSOP on http://www.chilipoker.com/. “We are very proud to announce such an innovative feature on our site and give both players and guests the chance to experience the WSOP with Liz”. Chilipoker Players should keep an eye on the Chilipoker school, as the poker diva will soon be revealing some of her best kept tips and winning secrets.